Earthbag walls are placed on 6 to 8 inches lifts/courses/rows line masonry walls. Earthbag walls are built in running bonds, the same as masonry walls are. Low-rise masonry construction does not require high strength masonry units, the same as earthbags construction. In addition, earthbag walls are always thicker than masonry walls, so the stresses will be lower. Most designers who design Rammed Earth use the masonry design equation. 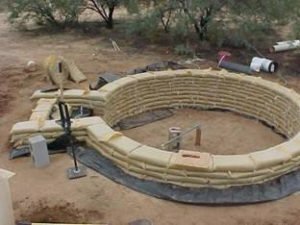 Since earthbag is Flexible Form Rammed Earth (FFRE), masonry equations can be used for earthbag wall designs. 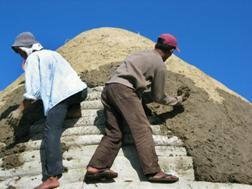 Plaster/stucco is usually used on each side of earthbag walls. This solves the issue of lack of shear strength of earthbag walls parallel to the wall. Also, it helps with bending moments due to loads perpendicular to the wall’s surface. In our practice at Precision Structural Engineering, we use stucco on both sides/surfaces of the earthbag walls. The Building Code requires a minimum amount of reinforcement to be used for earthbag construction. A vertical bar every 4 feet on center that is required by the Building Code for masonry construction for Seismic Design Category D, E and F could be used for earthbag wall construction. The bar could be added within the stucco thickness, or through the earthbag wall itself. The steel mesh in the plaster/stucco on each side of the wall. The steel bars in the bond beam at the top of the earthbag wall. The steel bars in the top of the foundation/ bottom of the earthbag wall. The barbed wire or the joint reinforcement used between the courses/rows of earthbags can be included in the required amount of steel. The earthbag walls can, and must be anchored to the roof or floor at their tops. BUILDING CODES GENERAL PART 4 2006 NEW MEXICO EARTHEN BUILDING MATERIALS CODE, sanco-bg.com/NM_Earthen_Building_Code, Attached, is a good source of information. The earthbag wall could be treated as a Masonry wall. An acceptable way to resist the horizontal force between courses such as barbed wire or masonry joint reinforcement, pending test results, or simply lime or cement mortar between the courses. Reinforcement could be added in the center of the earth bag itself at 4 feet on center or it could be place in the stucco at the outside surfaces of the wall. Concrete bond beam at the top of the wall with at least two No. 4 bars with lap of 30 inches and corner bars are essential. Roof must be attached to the top of the wall to resist the seismic forces. Please look for details that show the above requirement coming soon. The International Building Code and the International residential Code, or any other building Code, do not give me the power to give generic prescriptive structural design that could be applicable to any building. So, Please see the disclaimer below.